Keep body odor at bay and feel fresh all day long with this amazing Engage Deodorant combo. Engage presents a varied range of fresh and irresistible fragrances that give you a boost of confidence that you need to get through the day. 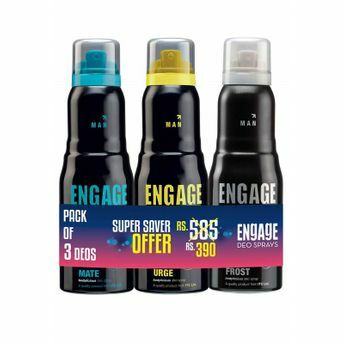 Additional Information: ITC's latest addition in Personal Care Products, Engage is one of India's first ranges of couple deodorants. This range of paired deodorants for men and women is crafted to enhance personal grooming and confidence with 24-hour freshness.